LAWRENCE — More African-American novels will be made available for digital research thanks to a Digital Extension Grant of $150,000 from the American Council of Learned Societies (ACLS) to support the work of the Black Book Interactive Project: Extending the Reach at the University of Kansas. The ACLS grant will support the Black Book Interactive Project’s work building the first searchable digital collection of previously unavailable and understudied African-American novels. The Black Book Interactive Project tool helps address a notable gap between the rise in digital, data-driven research and scholarship on African-American writing. By generating a system of categorization that accounts for race and race-related issues, the project helps correct this digital divide. The final product will connect computational methods, literary and linguistic analysis with topical and historical questions. Created by the Project on the History of Black Writing, the Black Book Interactive Project received initial funding from the National Endowment for the Humanities after English graduate students Kenton Rambsy (doctorate, 2015) and Will Cunningham (doctorate, 2017) initiated a pilot study. Maryemma Graham, University Distinguished Professor of English, is serving as the principal investigator of the project, and she will be supported by Arnab Chakraborty, English doctoral student and project manager, and a team of graduate students. As the project adds more content and descriptive data, it is also expanding the user base both inside and outside the university, and encouraging new working partners in this unique interactive environment. The Black Book Interactive Project will expand its list of partners through the ACLS grant, which involves a partnership with the College Language Association and the Historically Black Colleges and Universities Library Alliance. The project has also partnered with KU’s Institute for Digital Research in the Humanities and the University of Chicago. The University of Chicago partnership resulted in the conversion of hundreds of physical novels into a searchable archive and is leading to the development of a digital interface to facilitate user access. The Black Book Interactive Project’s overarching goal is to create a diverse learning community where scholars and practitioners can work creatively in producing new knowledge and opportunities for teaching and research. “ACLS developed the Digital Extension Grant program to build new communities of users around high-quality digital research projects in the humanities,” said John Paul Christy, director of public programs at ACLS. “The diverse set of projects supported by this year’s grants will advance innovative digital research while also bringing scholars together in new constellations of inquiry and providing new means of collaboration.” The program is supported by the Andrew W. Mellon Foundation. For information about the Project on the History of Black Writing’s ongoing work and activities, see http://hbw.ku.edu or contact Project Coordinator Jennifer Wilmot. The Project on the History of Black Writing and the Black Book Interactive Project are housed within the Department of English in the College of Liberal Arts & Sciences. The College is the heart of KU, educating the most students, producing the most research and collaborating with nearly every entity at KU. The College is home to more than 50 departments, programs and centers, as well as the School of the Arts, School of Literatures, Languages & Cultures and School of Public Affairs & Administration. 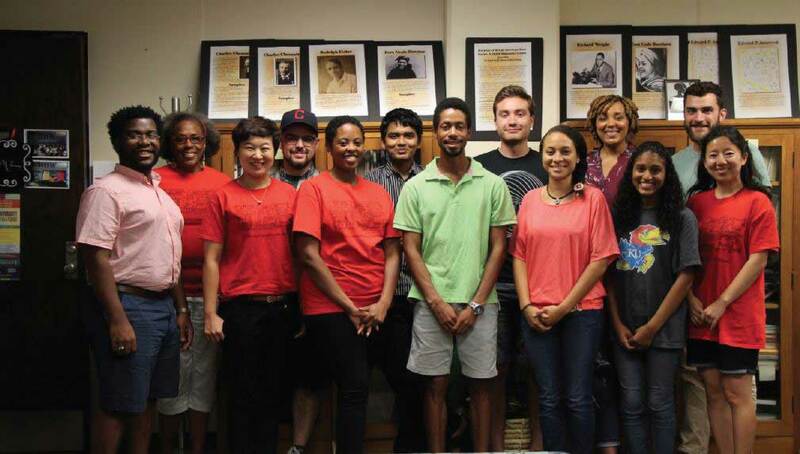 Image: Project for the History of Black Writing 2016 staff and affiliates, from left, are Anthony Boynton, Maryemma Graham, Wei Wang, Danny Caine, Alysha Griffin, Arnab Chakraborty, Matthew Broussard, Connor Noteboom, Crystal Bradshaw, Jennifer Wilmot, Mona Ahmed, William Cunningham and Hui Meng.